We’d love your help. Let us know what’s wrong with this preview of Worlds of Autism by Joyce Davidson. Since first being identified as a distinct psychiatric disorder in 1943, autism has been steeped in contestation and controversy. Present-day skirmishes over the potential causes of autism, how or even if it should be treated, and the place of Asperger’s syndrome on the autism spectrum are the subjects of intense debate in the research community, in the media, and among th Since first being identified as a distinct psychiatric disorder in 1943, autism has been steeped in contestation and controversy. Present-day skirmishes over the potential causes of autism, how or even if it should be treated, and the place of Asperger’s syndrome on the autism spectrum are the subjects of intense debate in the research community, in the media, and among those with autism and their families. Bringing together innovative work on autism by international scholars in the social sciences and humanities, Worlds of Autism boldly challenges the deficit narrative prevalent in both popular and scientific accounts of autism spectrum disorders, instead situating autism within an abilities framework that respects the complex personhood of individuals with autism. A major contribution to the emerging, interdisciplinary field of critical autism studies, this book is methodologically and conceptually broad. Its authors explore the philosophical questions raised by autism, such as how it complicates neurotypical understandings of personhood; grapple with the politics that inform autism research, treatment, and care; investigate the diagnosis of autism and the recognition of difference; and assess representations of autism and stories told by and about those with autism. 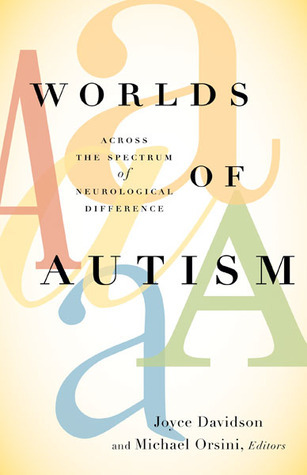 From empathy, social circles, and Internet communities to biopolitics, genetics, and diagnoses, Worlds of Autism features a range of perspectives on autistic subjectivities and the politics of cognitive difference, confronting society’s assumptions about those with autism and the characterization of autism as a disability. Contributors: Dana Lee Baker, Washington State U; Beatrice Bonniau, Paris Descartes U; Charlotte Brownlow, U of Southern Queensland, Australia; Kristin Bumiller, Amherst College; Brigitte Chamak, Paris Descartes U; Kristina Chew, Saint Peter’s U, New Jersey; Patrick McDonagh, Concordia U, Montreal; Stuart Murray, U of Leeds; Majia Holmer Nadesan, Arizona State U; Christina Nicolaidis, Portland State U; Lindsay O'Dell, Open U, London; Francisco Ortega, State U of Rio de Janeiro; Mark Osteen, Loyola U, Maryland; Dawn Eddings Prince; Dora Raymaker; Sara Ryan, U of Oxford; Lila Walsh. To ask other readers questions about Worlds of Autism, please sign up.